Flores Garden is an exclusive gated complex of apartments, located in the quietest part of the sunny resort Chernomorets, placed on first line of the beach and the sea. Built in Mediterranean style, the complex enjoys its own private beach, which is one of the few beaches on the Bulgarian Black Sea coast, that has been awarded the prize "Blue Flag". The area offers a combination of stunning scenery and good infrastructure, making it suitable for beach vacations, spa treatments and a range of water sports, as well as for permanent residence. "Flores Garden" is a remarkable complex, which consists of ten buildings of three or four floors with an area of 13,246 sq.m. The properties offered for sale here are 182 in number of several types - studios, one and two bedroom apartments, as well as townhouses. Most of the apartments enjoy panoramic sea views. All holiday homes are finished with high quality materials. There is a choice of furniture sets or custom designed premises at an additional price. The complex offers proximity to nature, many extras and restricted access for maximum enjoyment of your holiday. Available to the owners and their guests, there are a restaurant and a bar on the beach, marina, options for water sports and trips to interesting places of national significance along the Bulgarian coast. • Location in a quiet area with private beach in the resort of Chernomorets. • Interesting architecture with a good layout and low-level buildings. • Spacious apartments with diverse architecture and panoramic sea views. • Options for furniture; provided maintenance and letting of the properties on a hotel basis. 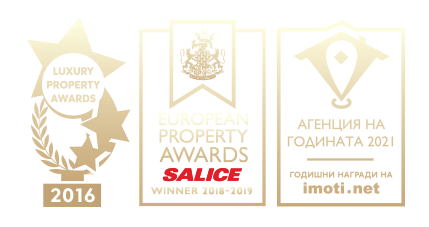 • Construction company with an impeccable reputation, constructed within buildings including complexes Pomorie Residence and Boyana Residence. Special prices until the beginning of April! The investing company offers professional property management by a registered management company. There is a constant presence of the company's representative at the reception. All owners must pay a fixed annual fee of 10 Euro / sq.m without VAT for their apartment. • organization and management of payments, associated with the common parts. There is also opportunity for individual property management. All apartments in Flores Garden complex are offered for sale fully finished with painted walls and ceilings, flooring, fitted bathrooms/wc and air conditioners installed. Owners have a choice of a set of furniture or custom designed premises. The individual furniture is prepared by designers company, part of the business group of the investors. • external and internal doors: UV poppy coating which provides moisture resistance, French doors of thick MDF 35 mm, waterproof, no hollow elements, coated with paint and varnish with white color. The doors have a very good sound and heat insulation. Built in Mediterranean style, the complex consists of ten buildings of three or four floors, placed on an area of 13,246 sq.m. The properties offered for sale here are 182 in number, of different type - studios, one and two bedroom apartments, townhouses. Most of the apartments enjoy panoramic sea views. All holiday homes are finished with high quality materials and a choice of furniture sets or custom designed premises. The complex offers proximity to nature, many extras and restricted access in order to provide maximum comfort, security and enjoyment during the holiday. Flores Garden complex is located in the quietest part of Chernomorets resort, on the first line of the beach and the sea. It boasts a private beach, which is one of the few beaches on the Bulgarian Black Sea coast, that has been awarded the prize "Blue Flag". The area offers a combination of stunning scenery and good infrastructure, being suitable for beach vacations, spa treatments and a range of water sports, as well as for permanent residence. Available to the owners and their guests, the hotel offers a restaurant and a bar on the beach, marina, many options for water sports and trips to interesting places of national significance on the Bulgarian coast. Only 6 km from the complex is set the oldest town on the Bulgarian coast - Sozopol. Some 18 km. away is to be found Ropotamo reserve. It covers an area of 1,000 hectares on the banks of the eponymous river, attracting with its dense forests and spectacular wild water lilies. The nearest international airport is the one near Burgas, 25 km away from the complex. The apartments can be rented on a hotel basis by a registered company of the investor. Each owner has the opportunity to receive an income from one’s property, which is repaid after the tourist season. Owners express consent to receive additional income by concluding a separate contract for rental. Flores Garden complex has been completed and has Permission for usage (Act 16) dated 30.01.2013. Each apartment in complex Flores Garden can be booked as a non-refundable deposit of 3000 Euro, payable by credit card or by bank transfer. Upon paying the deposit the apartment will be reserved for the period up to the signing of the preliminary contract - within 28 days. • 10% second payment immediately before the notary transaction. • 50% second payment up to 3 months, immediately before the notary transaction.